I like designs that incorporate the facial features. This fish is fun to paint and wear! Butterlies are a favorite. My butterfly designs are constanly going through metamorphosis. New ones emerge at each event. Some favorite princess designs by Fancy Face of Rochester. This is my basic face painting setup. For smaller events I leave the banner at home. The kids love being in the big chair. I will bring a menu board, such as this one, with designs for the kids to choose from. I also like to bring photos to show the finished product. This is my standard cheek art collection. These designs have been a hit with kids of all ages. 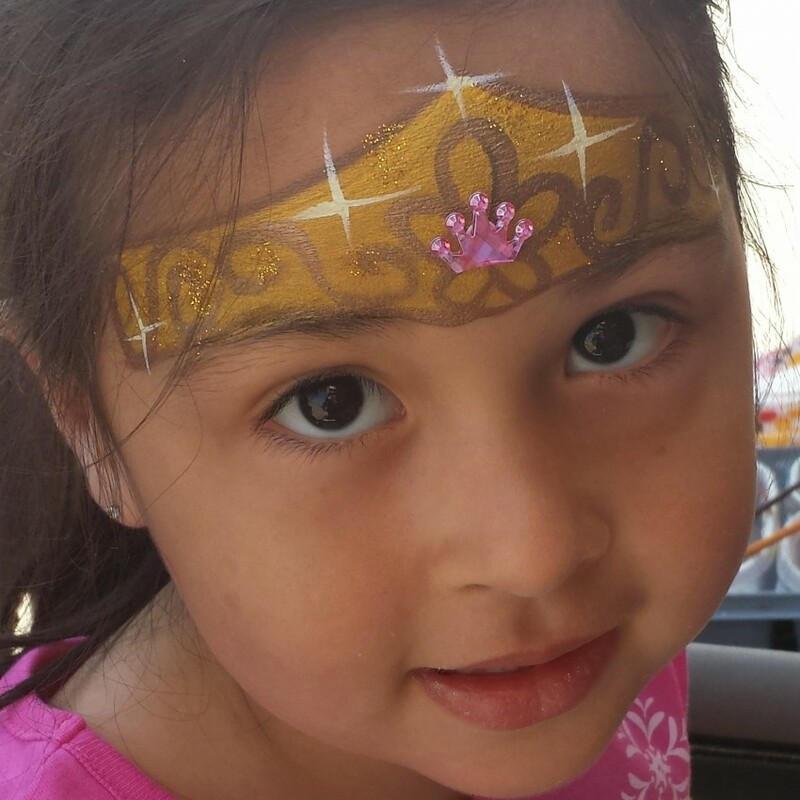 Glitter tattoos can be an add-on to face painting or a featured attraction at your event. Kids and adults love these! Not only will they add glamour to your event, they are also waterproof and sweat-proof! More glitter tattoos to choose from in a pocket hanger. Glitter tattoos are a great option for hot summer days or pool parties. They are water proof and sweat proof! Out balloon artist can come dressed as "Gadgets the Clown" or "MJ the Balloon Artist". She will bring a special sculpture just for the birthday child, and make balloon creations for all the guests. 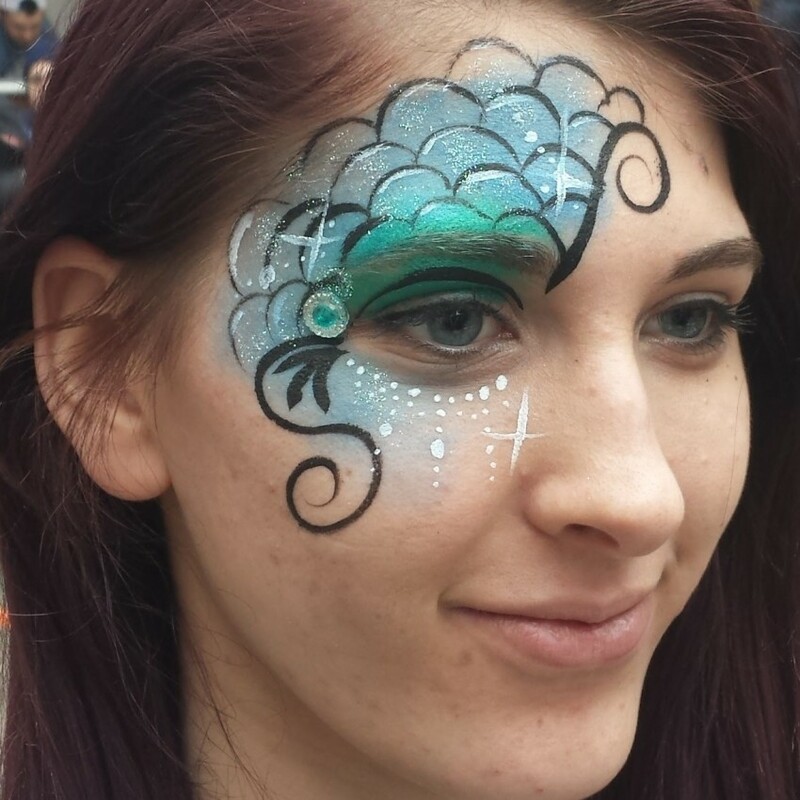 Fancy Faces of Rochester offers FACE PAINTING, GLITTER TATTOOS, BALLOON TWISTING, and SAND ART CRAFTS. 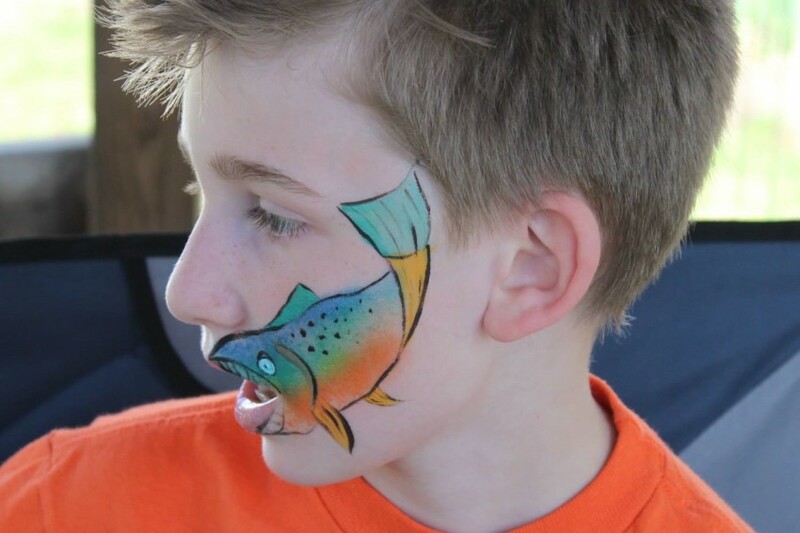 Fancy Faces specializes in high quality face painting, both cheekart and full face designs. We can customize it to fit the theme of your event! Waterproof glitter tattoos are great for summer parties or just adding bling! Our expert balloon twister will bring smiles to your guests faces with fabulous balloon art. Want to add a craft to your event? Let us take care of that and set up a sand art station for you. Let Fancy Faces make your special event memorable! I was looking for something exciting for my daughter's 5th birthday party and figures face painting would be a hit. Well all the kids loved their designs. Especially the birthday girl. She never wanted to wash her face. Kristen was great to work with, easy to communicate with and she was able to work witrh our schedule in such a short notice. Can't wait for our next party to hire her again. Fancy Faces face painting was a wonderful addition to our son's 8th birthday party! Our son wanted a "dragon" themed party and Fancy Faces came prepared with some extra dragon options for the kids to choose from. Every kid was able to find something they wanted from her large collection of choices. They all enjoyed taking a turn in her chair and each painting was artistic and well done! We would highly recommend Fancy Faces!! I hired fancy faces for my daughter's 6th birthday princess party and the kids loved it and do did the adults. Kristen is very talented and quick but thorough. She did an amazing job. I would definitely recommend fancy faces. Great activity to start the party!! We had Kristen come for my sons 3rd birthday party. The theme was Super Why. She was aware of all the characters and transformed my son into Super Why. He still talks about the face painter and wants her to come back! The kids at the party all enjoyed having their faces painted as well as my son's two grandfathers. Kristen was professional, on time and did a fantastic job. We will definately have her back. The artist(s) arrives 15-30 minutes in advance to set up. The set up includes a table and 2 chairs per artist, a poster display, and face painting and glitter tattoo supplies. Designs include a wide variety of cheek designs, full face designs, and stencil tattoos. Then the fun begins. Children choose a design from the poster or notebook, the artist checks on color choices, then transforms the child's face or hand into their wish come true. When the child sees their reflection in the mirror, their face lights up with wonder. The transformation takes about 3-5 minutes per child. Other children delight in watching the transformation take place. The adults exclaim at the finished product and take pictures. After all the children have gone, often the adults start requesting face paint designs or glitter tattoos. The face painting artist keeps track of how many have been done or how much time has gone by. When the agreed on number or time has been reached, the artist connects with the client about the balance due, then packs up. Wonderful memories have been created. Kristen's face painting has really taken off in the past 6 years. What started out as a hobby has bloomed into a thriving business. 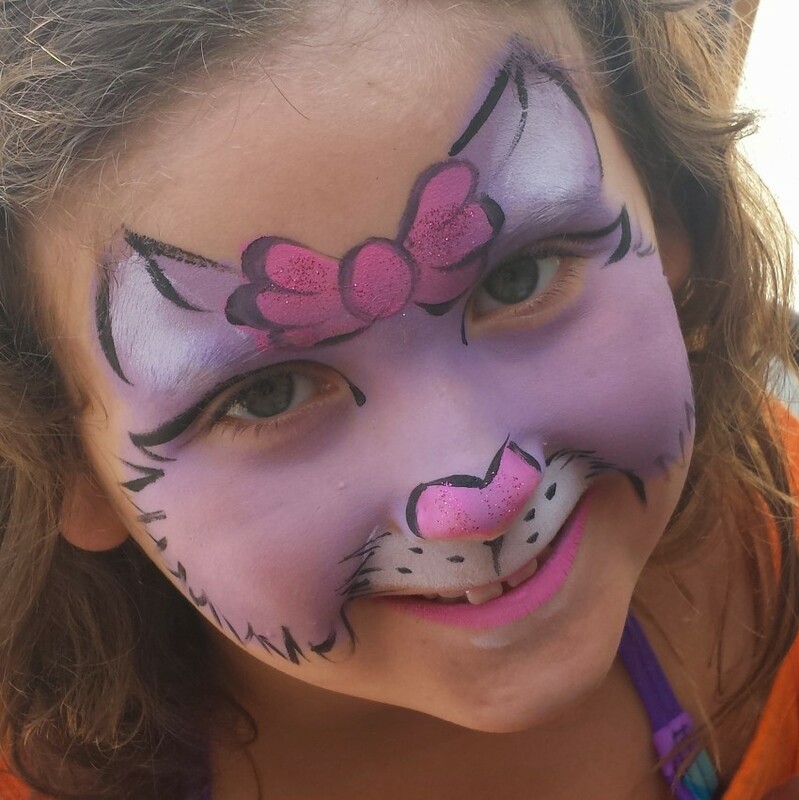 She is in increasing demand as a face painter in the Rochester area. 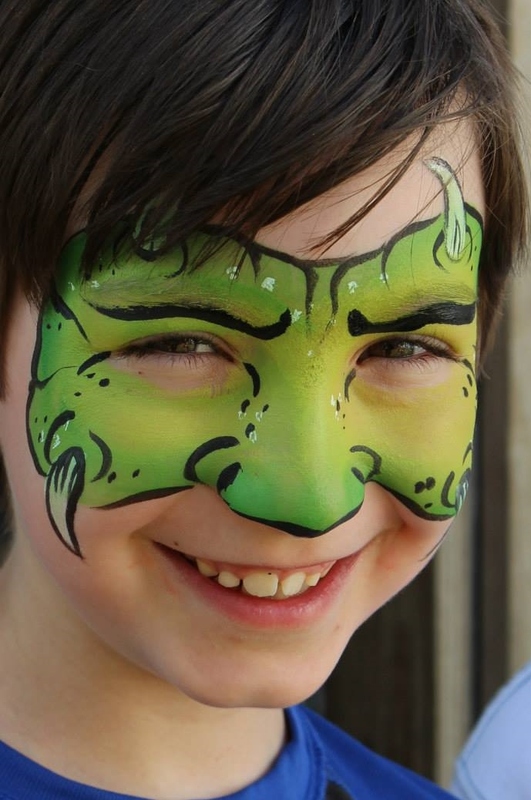 Many clients have commented that it's the best face painting they have ever seen. She is constantly working to improve her skills and create new designs for her customers. Face painting requires a well-lit area of about 8'x8' with room for a line to form, away from loud speakers. Parking: An unloading area close to the performance location and parking close by. Rain Clause: For outdoor performances, in the event of inclement weather, client will provide an indoor or covered area. I have been inspired by face painting artist Lisa Joy Young, whose Youtube tutorial videos are wonderful. A shaded area if event is outdoors. A canopy may be rented from us if you do not have one. A table for each artist (4' minimum) and a chair. These may also be rented from us if needed. Setup should be in a quiet area away from loud speakers.